Immaculate 5 bedroom, 4 bath, 3,211 sq ft single-level View home on a large 20,387 sq ft corner lot. Three car garage has finished walls and floors. Roll up doors with side door to outside and also a door into the large laundry room. Gated RV/Boat parking on either side of home. Custom wrought iron locking screen doors on all outside doors to let in the natural breeze. Ten (10) foot ceilings, open floor plan, audio speakers in every room, surround sound in family room, crown moldings, french doors, custom Spanish tiled floors, plantation shutters, solar system, and central alarm system. Living room has a gas fireplace, outside views and opens onto the covered patio and backyard. Large family kitchen features a center island, breakfast bar, walk-in pantry, granite countertops, ample cupboard space, and opens into the family room.,with a gas fireplace and a custom daily dining nook. Large master bedroom with french doors leads out to the backyard. Master bath features dual sinks, two large walk-in closets, jet tub, and Spanish tiled walk-in shower. 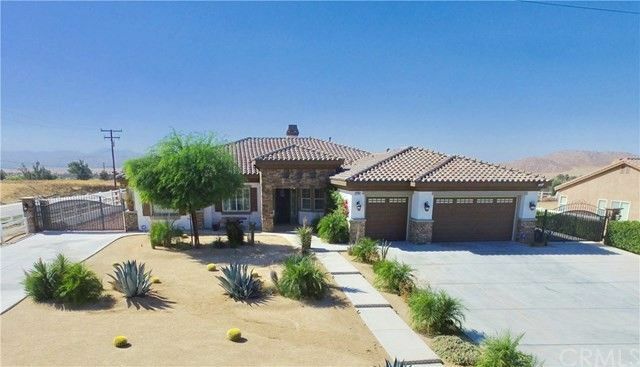 Entire property is fully landscaped, irrigated and hardscaped, for low maintenance. Backyard features, gas fire pit, basketball court, ceiling fans in patio, natural grass lawn, and views of the valley.